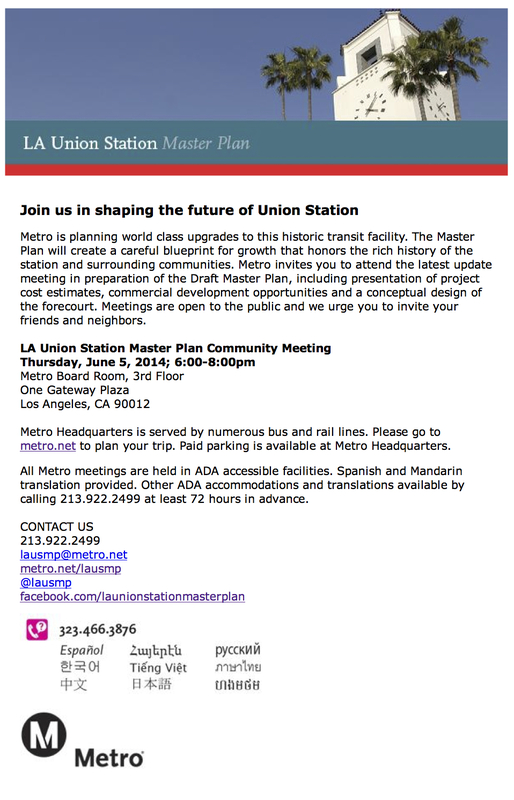 Work continues to chug along on the Los Angeles Union Station Master Plan; please see the above flier for the upcoming meeting on June 5. The Metro Board last year approved a plan concept that would construct a greatly expanded east-west passenger concourse while relocating the bus plaza to a north-south configuration closer to Alameda Street, allowing the many bus stops around Union Station to be consolidated. Metro Releases 2014 Bike Map! Another wonderfully example of the MTA’s PATHETIC waste of tax dollars on something that DOES NOT MOVE, as opposed to the buses and trains (that should be its FIRST PRIORITY!) that DO! If the MTA took the money from all of this NONSENSE that DOES NOT MOVE (e.g. Union Station “Master Planning”, North Hollywood Train Depot restoring, and Division 13 Maintenance Yard “redeveloping”-including the defective parking garage construction! ), and put it ALL into the buses and trains, there would be ZERO NEED TO have ANY “proposed” fare increases! I think it just means that paid parking is available in the garage under Metro HQ and Union Station and costs $6 for those who wish to drive.